And cheers for finishing X and Zero stories...and having the balls to kill them off. In short, happy 10th, Rockman Zero! Even to this day, you remain my favorite video game series of all time. Happy birthday "Megaman" Zero, it´s a shame capcom killed you by letting burn in flames fighting Dr. Weil,..... unless X´s elf used his merging cyber ability near to your last breath to fuse with you and become... the real "Megaman ZX"??? Happy Annivasery, MegaMan Zero. I'm glad MMZ Collection did so well with added features that were exlusive to Japan Versions of the MMZ series, but now we get to use them in MMZ3 as they are new to us Americans. Fight on, Zero, fight for ever lasting peace! A series that actually had some closure and thus will always be remembered fondly of. I still remember that kneejerk reaction I had seeing Zero's new style the first time. And I also remember staring in amazement at copy X as the last boss on some Japanese website before the game was released. I played Zero Collection last summer, effectively mastering the series by doing complete 100 S Hard Mode runs (albeit with the help of Mod Cards for Z3). So many "memories" with Kuwagust Anchus...Z2 is by far the hardest in the series to master. BEST MEGAMAN GAMES EVER ON A NINTENDO CONSOLE. HANDS DOWN!!!!! Oh man, so long. I remember the atmosphere of the first images. Didn't end up liking the games that much, but I like the art. It took me seven years to finally give these games a try. To me, they seemed a mockery of Mega Man. A lame gag. I hated the art style, and pretty much everything about it. But I became desperate for SOME new Mega Man, and finally broke down and tried one. After a few days I warmed up to them, within weeks, was a HUGE fan! I've always said they're the Ferraris of platformers. They play with such precision, and you not only need to practice and get good, but you CAN. The control is unparalleled. The music is excellent, I downloaded every track, and would listen to my concealed ipod nano all day at work. The story gets engrossing and really stands on it's own, as well as fitting into the overall Mega Man timeline. 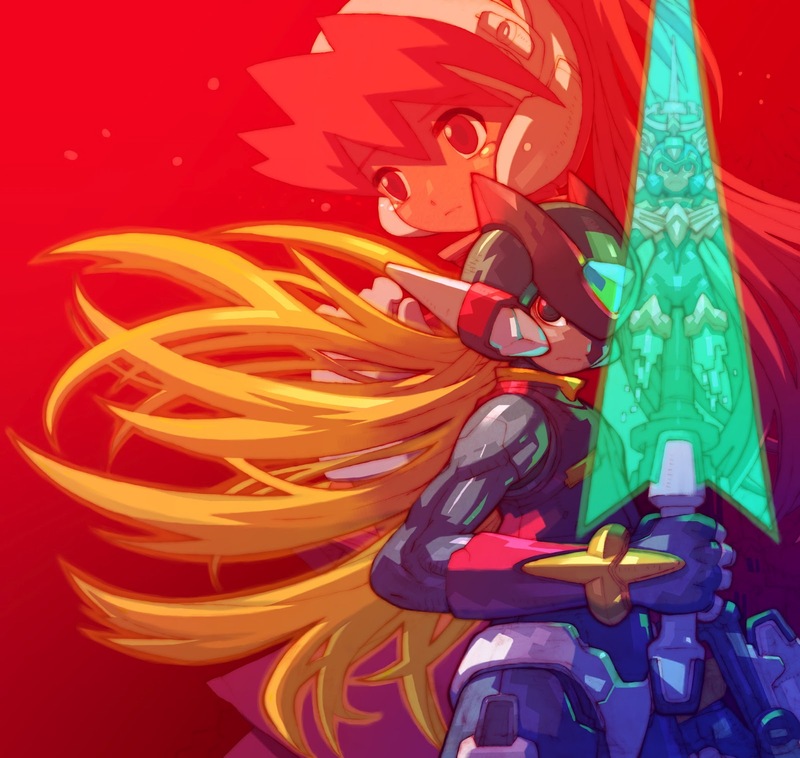 I think the Zero series as a whole is a masterwork, and I still play all the time. I'd love to see something more for this series. I admit, this series really got me hooked to Mega Man. The story was very good, the difficulty was challenging, and the controls were the best that I have ever seen in a platformer. It taught me stuff like how your allies can be dangerous, how war can ruin lives, and how your actions are viewed by those affected. It brought me happiness (especially when I realized X was still alive), and sadness (the many deaths that transpired like X, Zero, and others). All in all, this is probably the best series in the franchise. Some may argue that, but this is one of the two series with an actual conclusion. The controls, graphics, art, story, all of it is amazing. The fact it was portable made it even better, since one could bring it anywhere. Happy 10th Zero. You may be dead (?) but you live on. 10 years of creepy bug eyes and freakish Clamp-inspired anatomy. Wow... And I thought everything was at it's best on Game Boy Advance. I guess Mega Man was the hideous exception. I guess it won't be long before we can celebrate the 10th anniversary of the last time a Mega Man was actually released! I don't even remember how I got to play the game, but it was a ROM of the first game that got me hooked instantly. Hats off to you Zero series. If it wasn't for you I wouldn't be the technophile I am today.